On any given weekend during the month of October 2012, there were approximately 253,338 Catholics attending Mass in churches throughout the Archdiocese of Philadelphia, according to figures compiled by the archdiocesan Office for Parish Service and Support. If that sounds like a lot, it isn’t. According to the same statistics there were 1,159,966 Catholics registered in the 266 parishes of the Archdiocese. That means approximately 21.8 percent of all of the registered Catholics attended Mass in October, a month chosen because it is typical – there is no snow, few people are away on vacation and there is no major holiday to distort the figures. The figures supplied by the Office for Parish Services show observed Mass attendance in October 2012 (head counts are taken in all the churches during all weekend Masses) was down 9,488 from 2011 and down 125,456 from 2001, or a decline of 33 percent in the past 11 years. If you want to take it back even further, figures supplied in 1992 when there were 1,243,113 registered Catholics, Mass attendance was at 410,444 or 33 percent of registration. So much for the downside. There are also success stories out there that could be built upon. According to the figures provided, 74 parishes actually showed increased numbers from the prior year and not all of them were in areas one might expect. For example in South Philadelphia, which has been losing Catholic population for years, attendance was up 276 at St. Monica and 264 at Our Lady of Mount Carmel. Those parish areas are an easy work commute to Center City, and may reflect part of the return-to-the-city housing trend in the Philadelphia region. Of the 12 deaneries in the Archdiocese only Deanery 8, which covers South Philadelphia and Northern Liberties, showed a net increase in attendance from 2011. There were a total of 19 parishes in the Archdiocese where Mass participation exceeded 40 percent of registration. Some of these might be expected, for example Center City and Old City parishes that welcome many visitors to Philadelphia. That would include St. John the Evangelist with Mass attendance 54 percent of registration and the Cathedral Basilica of SS. Peter and Paul, 88 percent. Others benefit from proximity to universities, catering to students away from home, especially St. Agatha-St. James. With a whopping 242 percent of registrations it serves away-from-home students at the University of Pennsylvania and Drexel University. St. Patrick, which is just across the Schuylkill River, has attendance equal to 48 percent registration. The parish has a number of nonregistered graduate students with apartments in the parish attending its Masses. At St. Patrick Parish in Norristown weekly attendance was up 265. Father Augustus Puleo credits this entirely to an ever-growing Hispanic population in the area. When people come to make arrangements for a marriage or a baptism he emphasizes coming to Mass. Last year he noticed his Sunday morning Spanish Mass was standing-room only. He added another Spanish Mass but very soon the first was just as crowded. The cathedral posted a weekly increase of 355 worshippers, up 24 percent from 2011. Msgr. Arthur Rodgers, the cathedral rector, attributes this to the improved economy. Regarding tourism, the opening of the new Barnes Museum and the reopening of the Rodin Museum, both along nearby Benjamin Franklin Parkway, are probably having an effect, he believes, and the improvements to the small Sister Cities Park directly opposite the cathedral also draws people. Some who might visit during the week when volunteers are giving a tour might come back for a weekend Mass, the rector added. Adaptability is another key to continued viability. St. Patrick Parish in Kennett Square, Chester County, which saw a 265 increase last year, has 7,549 Hispanics on the rolls today, mostly Mexican. St. Cyprian, Philadelphia, which had an increase of 224 in Mass attendance, has 1,210 Black Catholics on the rolls. The reigning champion in size and still growing is St. Andrew in Newtown, Bucks County. With 9,009 weekend worshippers, an increase of 259 from the previous year, it has a highly respectable 45 percent Mass participation. “We like to think our emphasis on good preaching and excellent music at our Masses has something to do with it,” said Msgr. Michael Picard, St. Andrew’s pastor. Homilies, he noted, are generally limited to 10 minutes or so partly because of the necessity to empty the church and parking lot in time for the next Mass, but also “people appreciate a well-crafted homily that is to the point,” Msgr. Picard said. Other factors are a Sunday evening family Mass that is especially geared to teens. A Faith for Life program focuses on families of parish school and PREP children, encouraging families to come to Mass together. There is further evangelization through encouraging the many parish sports teams to attend Mass as a body. A bonus to all of this, “new families coming in to the parish seem to be practicing Catholics,” Msgr. Picard said. The changing environment has meant fewer parishes but with larger territories. Some parishes have been dealing with that for years. For example St. Patrick, Kennett Square, has been around 144 years and with 60 square miles to cover, has been holding its own with a 25 percent attendance. To see statistics for any parish in the Archdiocese go to its website, archphila.org, click parishes then select an individual parish and scroll down to the section titled Report to Pastor. The article says St. Andrew’s Church in Newtown has shaved their homilies down to 10 minutes. This is where they should strongly emphasize the teachings of Jesus and the Word of God. Ten minutes is not enough time to express a meaningful message. They need to work something out – additional Masses or more space for attendees to do it right. 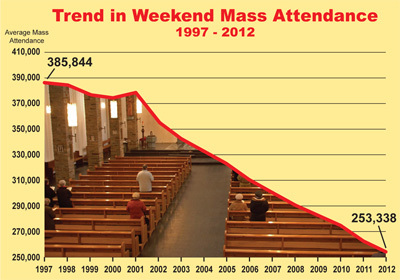 It is sad that fewer people seem to be attending weekly Mass, but I have high hopes. Our little church in Abington does have fewer people, but there appears to be more young people now, like 20 somethings. We have been offering Bible study and we had 29 for the first five weeks in the winter and 23 or so for the second five week study this spring. We even have a summer Bible study with about 10, plus the daily Rosary which has a regular following. Personally, I think “build it and they will come” is a good evangelization philosophy. Offer stuff, and gradually it will catch on. Scatter good seeds and some of them will fall on fertile soil. Republicans advancing Christian social teachings? Like looking after the poorest amongst us, such as ‘trailer trash’, illegal immigrants, prisoners)? The Republicans opposed every single health care reform measure which has extended coverage to some of our poorest countrymen. And every single gun reform measure. And every sigle attempt to raise the minimum wage for people just existing on a paltry salary -those low skilled workers who represent what Christ called the ‘least’ of His brothers. Please don’t use the words ‘Republican’ and ‘Christian’ in the same sentence. Jesus weeps when you do. so the Mass attendance figure should be closer to 30%. The practical problem is that the local Republican Party would not be as interested in advancing Catholic Social Teachings if the real parish registration number was known; similarly the National Republican Party would probably ignore the Catholic Church if it thought that the actual number of Catholics was 48,000,000 not the reported 66,000,000. People flock to the Basilica of SS. Peter and Paul because it is a real church whose beauty and majesty recalls the beauty and majesty of the Triune God. SS. Peter and Paul is shaped like a cross; there are real, magnificent side-altars; there are relics of saints (or at least statues); there is real organ music, and at times incense; there is a dome, stained glass, and Stations of the Cross that show directly the Passion of the Christ. Imagine a tourist from Oklahoma perusing the Philadelphia Museum of Art, the Rodin Museum, the Academy of Natural Sciences, the boulevard of flags along the Parkway, to arrive at some post-Vatican II flying saucer, sterile save for felt banners and lousy abstract art where the Stations of the Cross would normally bear witness, while some kid in flip-flops bleats over a banjo. The poor tourist would shake his head and walk out. The “Old Evangelization” of the beauty of the senses carried the Church for over a thousand years. Even Pope Emeritus Benedict had called the implementation of Vatican II a calamity. When will the bishops ever learn! The reality is that Mass Attendance in the Archdiocese of Philadelphia is 22%. There is no way to sugar coat this figure; it is simply awful. The statement that in light of the Mass attendance reality perhaps we should start evangilizing is ridiculous. It is like rearraqnging the deck chairs on the Titantic.